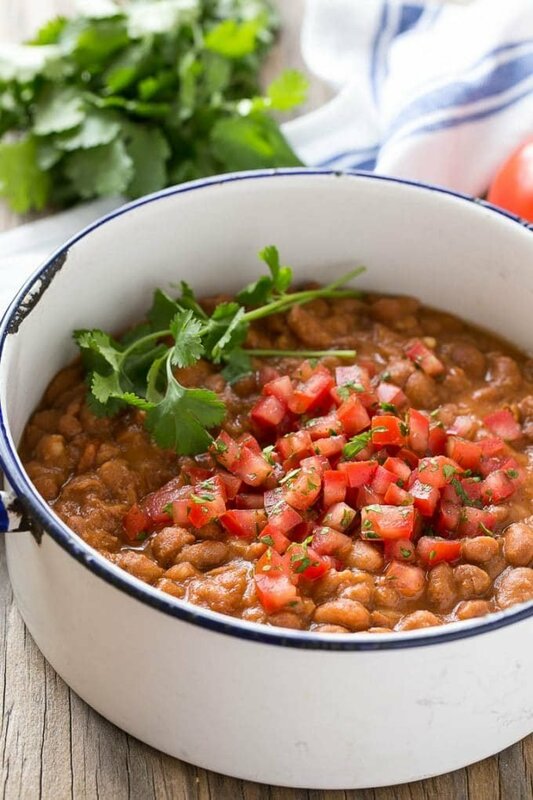 These pinto beans and rice are the perfect sides for your Mexican meal. 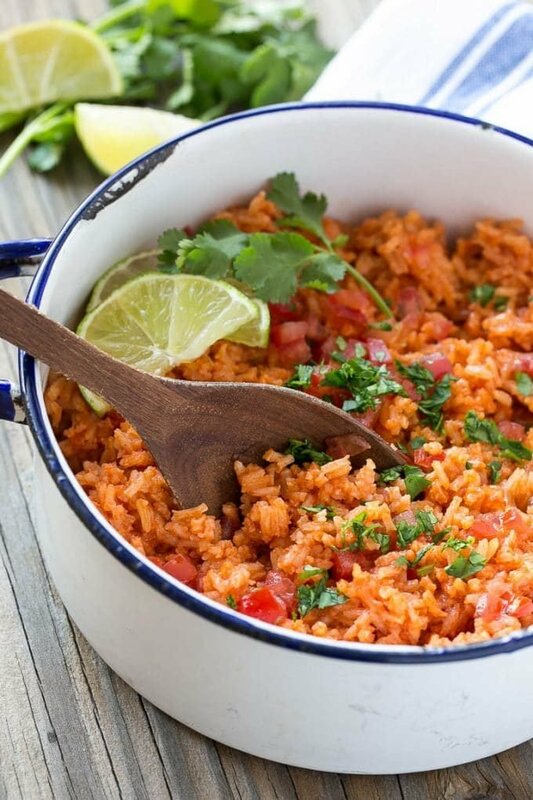 The mexican rice has a secret ingredient that makes it taste like it came from a restaurant, and the pinto beans are ready in just 10 minutes. We eat Mexican food at least once a week, and these delicious beans and rice are on the menu every time! Who loves Mexican food? I sure do. We have a Mexican restaurant in town that we’ve been going to for more than 10 years. The girls love it there too, but have you ever tried to eat out with three kids under the age of 4? If you have you can understand why we don’t do it that often, it’s not exactly a relaxing experience. Savor my food? More like scarf it down while the baby (who refused her high chair) sits on my lap and scoops up my food with her hands, getting some into her mouth and some all over my clothes. Because who needs clean clothes, and who needs a kids meal when mom’s food looks so enticing? It’s a good thing she’s cute! So typically I make stay home and make my own mexican food like these pinto beans and rice! My daughter Alice is in love with this restaurant’s pinto beans. They call them cantina beans, and she likes them so much that she would be happy to just have beans and nothing else. I decided to try and replicate them at home. Now, I know that you’re supposed to use dried beans, and that they are superior in most ways to canned. I tried it with dried beans and I just couldn’t get it right, the beans turned to mush before the sauce thickened up. I use canned beans for this recipe; it works perfectly every time and it only takes about 10 minutes to make the recipe start to finish. Who can argue with that? 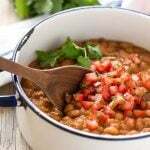 These easy Mexican pinto beans are seasoned with chili powder and simmered in a little chicken stock and tomato sauce. That’s it, super easy but they taste like they’ve been cooking for hours. 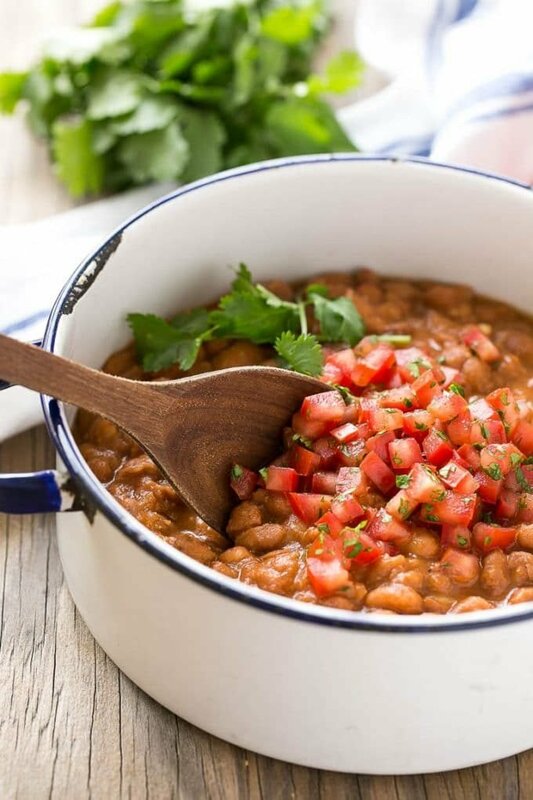 I top these beans with fresh pico de gallo like they do at our restaurant but that’s totally optional. 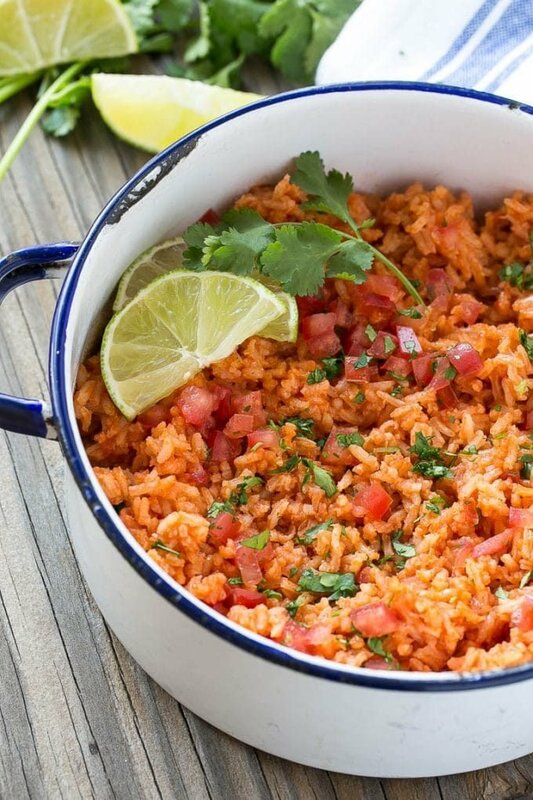 I have been experimenting with mexican rice recipes for years. I could never find a recipe that was quite right until one of my fellow twin moms posted her favorite recipe on her blog. I made a few tweaks to suit our taste, and here it is: what I consider to be the best mexican rice recipe. The secret ingredient? Bell pepper slices! They infuse the rice with flavor as it cooks and then the peppers get discarded at the end. Or you can eat them for a snack, that’s what my husband prefers to do. My daughter Cora was patiently waiting for me to finish taking these pictures in hopes of snagging a taste. 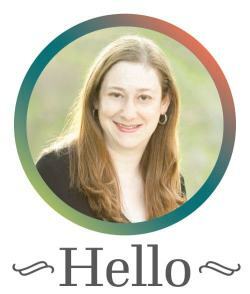 My local mom’s group has a program called Helping Hands where we provide meals to other mothers who have just had babies. 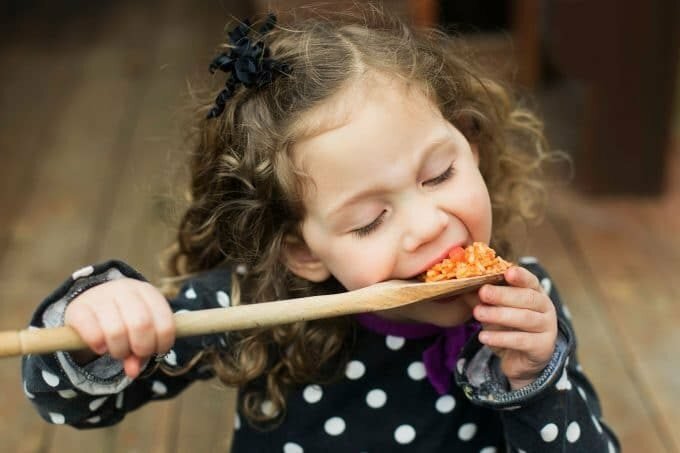 I love to bring them a taco kit for dinner – these rice and beans, some type of meat, taco shells and tortillas, shredded cheese, olives, salsa, lettuce and sour cream. It’s perfect because it reheats well and everyone gets to create their own tacos so you don’t have to worry about other people’s picky eaters. So now that we’ve got our easy pinto beans and rice, stay tuned for the next component of my perfect Mexican meal: Mexican carnitas. Heat the olive oil in a 2 quart pot over medium heat. Add the rice and stir until the rice is coated in the oil. Cook for about 5 minutes or until the rice is toasted and lightly browned. Add all of the remaining ingredients. I recommend doing this off the heat to avoid splattering. Return the pot to the burner, bring the contents to a boil. Cover the pot and turn the heat to low; cook for 17 minutes. Take the pot off the heat and let it stand, covered for 5 minutes. Remove and discard bell peppers. Stir well. Garnish with tomatoes and green onions if desired. Put all of the ingredients in a pan over medium-high heat, bring to a simmer. Cook for 7-10 minutes until sauce has thickened. Taste and add more salt or chili powder if needed. You can also add a bit more chicken stock if the sauce gets too thick for your liking. Garnish with pico de gallo if desired. Make Ahead: This rice is actually great reheated so it can be made a day in advance. It has enough moisture from the tomato sauce and chicken stock that it doesn't dry out in the fridge. Little Helpers: Let your kids measure the spices and help take apart the bell pepper. If that label is correct, 950mg salt per serving is too much for me. Just checked and it was displaying higher than it should have. The numbers don’t take into consideration that the beans are rinsed which removes a lot of the sodium. If you want to cut sodium further, use low sodium chicken broth. I made these today after finding canned beans with low sodium and minimal additives. I followed your recipe the first time I made this last weekend and today I had some tweaks. Both were very good. I roast chicken breast and freeze them for quick weeknight meals or to use in a green salad. Any drippings from roasting I freeze. Instead of using chicken broth I added about a table spoon of the roasted chicken juices minus any fat. Everything else in the recipe was added but in differing amounts and I think I might have added cumin. The rice was very good although first time I used basmati rice and the second time bando rice. However, I would like to transition this to brown rice. I did combine this with roasted chicken that had been simmered in enchilada sauce, onions, and cilantro. What I ended up with was a chipotle styled burrito bowl. Mexican rice on bottom, pinto beans, chicken, fresh corn seasoned with chili powder, Monterey Jack/pepper jack (abt 2 tbsp), romaine lettuce, pico de gallo, reduced fat sour cream and a few finely diced jalapeño on top. It seems like a lot but it really is n’t because I pre-cook somethings (chicken breast in enchilada sauce I had on hand). The only thing that took time was the pico, and dicing the bell pepper (I leave it in rice), and getting the lettuce washed. The rice cooked just fine in my rice cooker. The corn I’d frozen last year. I did amp up the tomatoes by using tomato paste from a tube as well. So glad you enjoyed it! I think you could definitely use brown rice, you’d just have to increase the liquid a bit and add more time for it to cook! I just found this a coupe of days ago in my quest to find a healthy side dish for my chicken enchiladas I am making tomorrow. I was wondering if the beans you used were low sodium or not. I’m using your nutrition facts as I need to watch sodium in my diet. Thanks for posting recipe and also to the person who indicated it’s ok to just toast the rice as that’s is my approach as well. My husband I think we’re gonna like this and I’veplaced it in my recipe book. You can absolutely use low sodium beans! I know this is years after this recipe was originally posted, but I just came across it on Pinterest and I wanted to let you know how awesome it is. I love the idea of putting the slices of peppers in the rice and then taking them out. I have a 5 year old who now hates any bits of veggies in his rice, but doesn’t necessarily mind the flavor. I have been struggling with making a flavorful rice that he will still eat and this is the solution to that problem. Thanks a million. I came across this recipe on Pinterest recently. I had my parents over for dinner yesterday, and decided to make your Mexican Pinto Beans and Rice along with steak tacos. Your recipe for Mexican Pinto Beans and Rice were SO good! Everyone kept saying how great the meal was. Also, very quick to prepare and so easy to make! Thank you for the outstanding recipes. I sent the link along to my sisters, so they can make these great dishes too! This reheats really well, just store in resealable containers and microwave until warm! eeks!! what is the pinto can size?? I have a large can I want to use — I’m assuming, this recipe is the normal 15 ounce can? This is the normal 15 ounce can size, but the recipe should easily double if you’re using larger cans. I made it with the bigger can and doubled both sides. It served as a main dish for our family of six and man, THEY GOBBLED IT UP! This is one of the most fantastic recipes I’ve had in a while. LOVED this recipe so much. It’s added to our Faves!! Thank you!! You’re welcome! So glad to hear you liked it!!! Made this dish today and my husband and I loved it!! !